The Immortals looks like the usual heist thriller but it's not. Jack (Roberts) assembles a team of thieves to rob money from different parts of town and it leads up to the double cross of gangster Dominick Baptiste (Curtis). On the outset it looks the thieves have nothing in common except one thing....which I can't reveal because it's pretty original for a direct to video action movie. Speaking of action, it never stops. If you like bloody gunfights, this is your movie. It was a good idea to cast Tony Curtis. He classes up the movie. 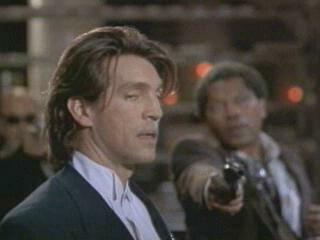 Eric Roberts is excellent as usual. William Forsythe, Joe Pantoliano, and Tia Carrere as the thieves step up to the plate and give it their all in the roles. Chris Rock, on the other hand, looks confused to why he's in the movie. 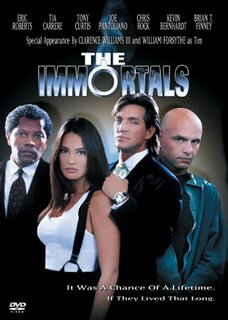 The Immortals is worth watching for the different plot twist and non-stop bloody action.